We are finally here. The Super Bowl. Its biggest sporting event in all of sports and it just so happens that this is the Patriots third year in a row playing in it. It's incredible. They won in the most unbelievable way two years ago coming back, in the first overtime Super Bowl game, from a 28-3 deficit against the Falcons with about two minutes left in the third quarter. Last year they lost to the Eagles which was so disappointing, considering the rumors about Gronk retiring in the offseason, not to mention it felt that the Patriots were such a heavy favorite and it was a for sure win. This year they are playing the Rams in a similar situation that they were in against the Rams in their first Super Bowl. 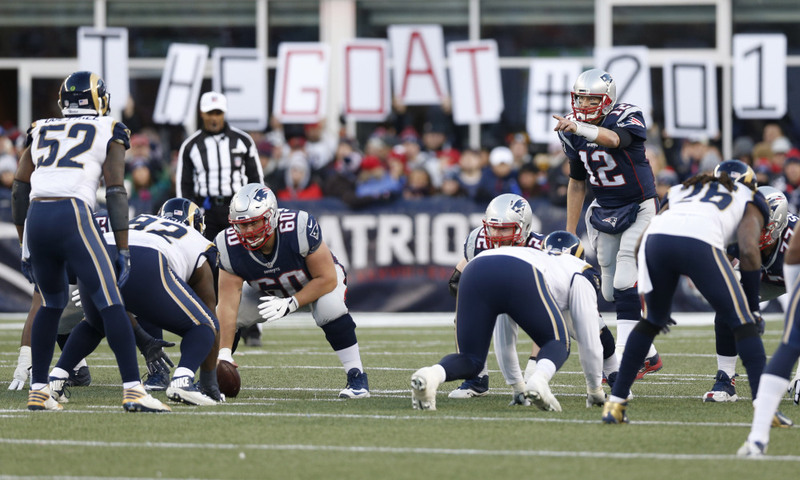 The Rams had a ton of experience while the Patriots were the new kids in town. However this time we are hoping for a different outcome for the veterans. The Rams play a man to man coverage. The name of the coverage speaks for itself. All of the Rams back seven will have a man to guard and they will be responsible for that person. The Rams have allowed 299.0 yards per game this postseason, 250.0 passing yards and 49.0 Rushing yards this season, the fewest rushing yards allowed by any team this postseason. On the contrary the Patriots have rushed for 165.0 yards per game and passed for 345.5 yards per game. One of the biggest factors in this game will be keeping the pressure off of Tom Brady, which I'm sure you've heard a million times this week. Surprisingly the Rams have only had three sacks this postseason, while the Patriot haven't allowed a single sack this postseason. After watching some gameplay on the Rams defensive line, they use swim moves quite a bit. With that being said they open up big holes that the Patriots can run a blocker through and have one of their halfbacks follow through for big gains. The Patriots have such a big advantage if they can get the running game working early. In my opinion, if the Rams can't stop the run game, we are going to have a major blowout. When the Patriots run the ball like well it allows them to run whatever play they want on 2nd and 3rd down. In the AFC Championship game the Patriots were 13/19 on third down because they were in a lot of 3rd and short situations, which allows you to run, pass or do a play action. In multiple situations the Patriots used play action passes which makes the Linebackers bite hard on the run and then guys like Hogan and Edelman are running right behind the linebackers for 8-12 yard gains. On the other side of things the Patriots were able to fake pass and run a delayed run plays and have 10-15 yard run gains. If the Patriots run the ball early it will make the Rams' d-line very tired around mid third quarter and fourth quarter. Also, the Patriots need to come out get rid of the ball quickly because of the powerful line that the Rams have. The Patriots can run a lot of slants, out routes, drags, pivots, and option routes. The same goes for the Patriots defense. They have to eliminate Todd Gurley and CJ Anderson. If they eliminate the Run there's no chance Jared Goff can beat the Patriots on his own. He's a great quarterback and I believe he's going to have a great career for the Rams but he just isn't quite there yet. The Patriots run a mixture of zone and man to man coverage. One thing that the Patriots did well against the Chiefs was pressuring Pat Mahomes. They used a combination of linebackers and linemen to run a five person front. From that point they used delayed blitzes to create pressure. Although if I am able to see that, certainly the Rams picked up on that and have been working on it all week. But knowing the way belichick coaches he probably will have a different type of schemes to create pressure. With all of that being said, I do think that the Patriots win tonight. I think they win 34-21, wining their 6th Super Bowl in the Brady/Belichick/ Kraft era. I think that their first drive is long and methodical, just like their last two games. 8-13 plays with a time of 8-10 minutes taken off of the clock. I think Burkhead has a touchdown, I think Michele has two, Dorsett has a long touchdown, and Edelman has one as well. I think that Pats create two turnovers and take a 17-7 lead going into the half. While Gronk doesn't score, I think he has a tremendous day of blocking for the running game and has 7 catches for 85 yards. Also this is the last X's and O's of the year. With that being said if you read this blog one time or read it every week, thank you so much for contributing to this wonderful blog, PatriotsLife, that I get to be apart of. Now lets go win this Super Bowl and get number six!